Pippa brought this back as a laugh when she passed through Dubai recently. Rose geranium (my favorite Floris bath soap scent!). It is a soap, but an olive oil soap, so the scent might be the best part, although it does have some beeswax in it too, so it may not be as thin and useless as most olive oil soaps. are you planning on giving it a whirl given the olive oil ingredient? I spent an hour on the treadmill and afterwards I really needed to use some soap. 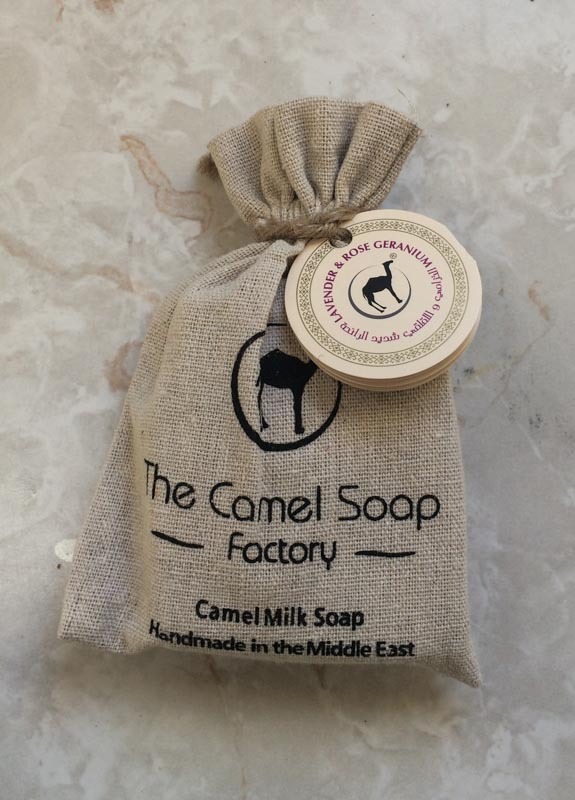 So I did use the camel milk soap and it wasn't horrible. A bit more drying than I like for washing hair, but fine everywhere else. Lovely scent. It would be easy to use olive oil as the fat in a home made soap, and I feel a slight temptation as I never have used it in the past. On the other hand, I have tried many commercial olive oil soaps and not one of them ought to be allowed anywhere near a shave. Possibly mixed with other fats it might be worth the effort, but I have a few kilos of my own recipe to use up first. A South African woman? I don't see how it affects the soap and its functionality. The soap's lather has the same feel as any other olive oil soap I have used - there is a marked slipperiness even when there is little foamy lather. I don't know how to describe that, but anyone who has used an olive oil soap will understand. I like the scent, and I find it works quite nicely as a bath soap. It is not a shaving soap, and nor is any other olive oil soap (unless you have joined the cult of he was not to be named). I find that any soap with a lot of olive oil is unduly difficult to lather but it has positive sides too. The skincare is excellent. Strangely, I am enjoying this soap far more than I expected - lovely scent and the slippery Castile soap lather is tolerable. If I was still using bar soaps in the shower, I'd be placing my order already! I'm going to make a note of this just in case I find myself buying bar soap again. I wonder what the "sell by" date would be on a quart of mail order camel milk. A couple of weeks ago I visited Trader Joe's here in my hometown. 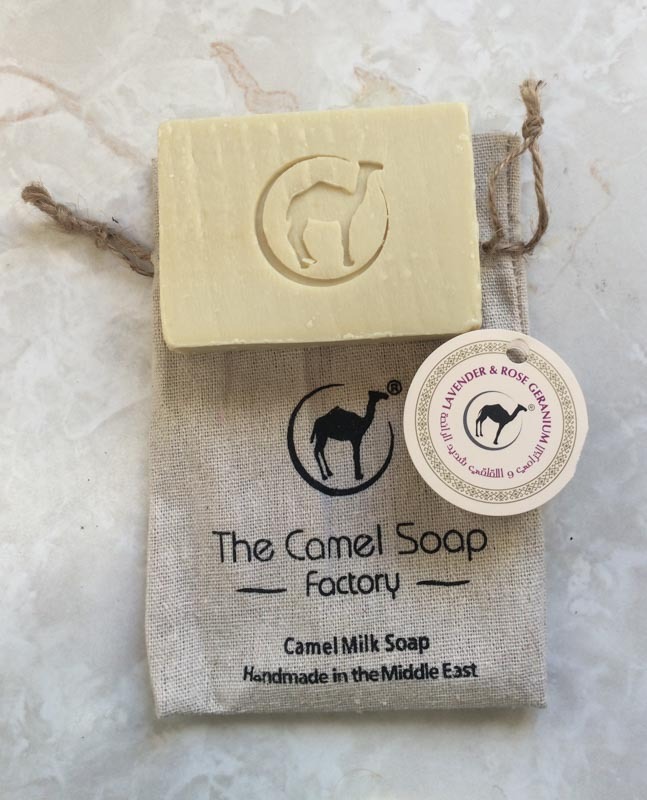 They had a display of the Camel Milk bar soap selling for $1.98. There were hundreds of bars in the little burlap bags. Must be selling pretty well. I didn't buy one because I'm not through using up my last bottle of body wash. The last time I started buying bar soap I ended up with about 17 bars and it took me a year and a half to use them all up. I don't want to get stuck in that rut again!